You are told chances for error on your stroke increase when you increase the number of joints that move during the stroke. Since the larger hip, knee, and shoulder joints are moving during the stroke because they rotate for the kinetic chain, what joint can you stop moving for stroke consistency since moving too many is bad? The wrist joint and to some degree the elbow, according to the accepted hypothesis. What if the larger body parts were not moving so much during the stroke or moving less. Would moving the smaller wrist joint still be considered "excessive" joint movement leading to stroke inconsistency? Less excessive? Could it be a balance of all joint movements that leads to inconsistency, that reducing one allows more of the other? A second hypothesis forms. Vic Braden, though not alone, advocates to reduce your chance for error and increase your forehand's consistency your "hitting wrist must be kept firm and must not change its original position on the backswing or forward motion." Not changing position means the wrist is locked, or inflexible. Therefore don't pronate, or "roll," the wrist joint. Ask yourself why, when standing still and bouncing and hitting a ball while moving the wrist and elbow joints, you have decent control over these small body parts and they are not a liability. Of course the elbow and wrist joints are liable to excess movement on their own even when you're standing still, but when the body moves during the stroke (rotation) you're supposed to lock the wrist? Revolutionary Tennis asks, is it wrist movement or body movement that leads to stroke inconsistency? Which has greater influence on the other? Wrist movement at the joint is called extension or flexion (up and down or left and right), ulnar or radial deviation (sidewards), pronation or supination (like turning a key in a lock). All pros say they use their wrist on their shots. Agassi says, "I take the ball on the rise and play with a lot of wrist, (Inside Tennis, Oct/Nov, 2001)." Either pros use their wrist yet suffer not the dreaded fate of inconsistency as prophesied in punditdom, or they don't use their wrist and are unaware of what they're doing when they do it. The wrist is the point of least resistance on any tennis stroke because it is smaller and weaker than either elbow or shoulder joint. The question we need to ask is, how best to support this point of least resistance? Lock it up so it doesn't "change its original position on the backswing or forward motion," or are the pros showing us a better way by using their wrist and we're not seeing it or understanding it? In fairness, at contact the wrist is held firm, it is strong as the ball strikes the racket, it should not go soft, though this happens often to everyone. Firm does not mean inflexible or locked. Furthermore, using the wrist on a forehand, known as flexion plus deviation with pronation, does not mean snapping the wrist, flicking it, flopping it, or flexing it as if shooting a basketball. Newton's third law, of equal and opposite reaction, is present with every contact. You hit the ball in one direction, the ball hits the racket face in an equal but opposite direction. You might not think it's material, but it very much is. Failure to counter this reality may be the main reason your racket face pops open and you get miss hits or out-balls. How to counter this is the subject of a paper titled "Hand Use For Contact," and more hand/wrist info is found there. The advocacy of a firm, or strong wrist-at-contact is meant to counter Newton's third law so the racket doesn't pop open. There are two ways to do this on a forehand in particular. One way to counter is to lock up the wrist before and through the contact so it doesn't "change its original position on the backswing or forward motion." This is a static counter-force, the wrist as block-back. If you do this the follow-through is a volley's follow-through, that is the racket remains angled backwards because the hand/wrist is locked and extended, or laid back. But no pro looks like this after contact on a forehand. 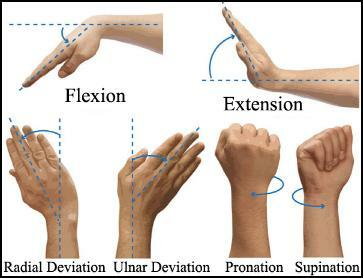 A second way to counter Newton's third law is to move the wrist, and this wrist movement involves some flexion with deviation and pronation, often referred to as pronation only. This is an active counter-force, the wrist pushes back. What happens in tennis is the same as when throwing a baseball: the wrist begins to flex forward from its extended position and begins to pronate prior to release/contact. With this second counter-method increased ball velocity is realized, and everyone can do it regardless of grip, spin, or strength. Pundits suggest a mix of pronation and deviation in a pro's forehand occurs voluntarily after contact because that's when it is seen on film. It can not, by then it is too late. Can a pro's wrist be locked, and then flex/pronate/deviate after contact as two separate acts? Unlikely. Do you throw a baseball with your wrist locked in place only to break it, or flex it, in your follow-through long after the ball has left your hand? Revolutionary Tennis asks why are we denying the natural and material movement of the wrist joint? Because the shoulder and hip joints are supposed to move, or rotate? Quite the opposite may give answers. The best chance to control the natural use of the wrist joint is by reducing the amount of movement in the larger shoulder and hip joints. This is yet another view of how body rotation can be counterproductive to our success. It is unquestionable the hand pronates throughout the forward stroke and into the ball, and it is unquestionable there will be some upper body rotation during a forehand's forward stroke. But aggressive, dedicated, sacrosanct, or pronounced body rotation will easily overwhelm the point of least resistance, the wrist, and the end result is inconsistency. Control the body to use the hand, not the other way around. Agassi didn't say he was "wristy," he didn't say he "snapped" his wrist, he didn't say he "flopped," or "broke," or "flicked" his wrist. He didn't even say he "rolled" his wrist. He said, "I take the ball on the rise and play with a lot of wrist." As in he's using his wrist. Braden shot video of Romanian touring pro and natural talent Ilie Nastase to rebut the idea that "his topspin shots came from an exaggerated roll of his wrist," as written by Peter Horner in December, 1986. When the ball was seen on video to leave the racket "by the time Nastase rolled his wrist" Braden concluded a wrist that rolled after contact couldn't affect the spin of the ball. Instead the video showed topspin as a factor of a racket face vertically on the ball and brushing up low to high on a sharp angle and not of a racket face moving around the surface of the ball or of a wrist rolling after contact. Nastase's topsin, though, was never in doubt. Presumably a wrist that rolled after contact was rolling before contact. When throwing a baseball as described above, or when shooting a basketball (Step 8 Addendum), you don't see wrist movement until after the release. Nastase's exaggerated roll of the wrist is seen after contact, which for us is the release. Braden's "experiment" only proved a wrist roll after contact was not contributing to the (top) spin of the ball, but he did not prove Nastase's wrist rolling before contact had nothing to do with his topspin. Nastase hit the ball with topspin, he was placing his racket vertically on the ball and brushing up. The fact he used his wrist to do this was ignored. Topspin is a question of brushing up low to high on a sharp angle, it can be done with either an open racket face or a vertical one, though vertical is more common. And it can be done with either a locked wrist or a rolling/moving wrist, which Braden's experiment did not explore. Video does not and can not show any wrist displacement prior to and during the contact since the movement is so small. On video it looks like the wrist isn't moving at all prior to and during contact, and Braden opined a locked wrist was better at placing the racket vertically on the ball than a pronating one. His choice also fell squarely into the fewer-moving-joints-are-better argument. Braden's forehand groundstroke was unique only to him, the wrist was to be held extended back on the follow-through like on a volley, and held up high forward toward the net. What is missing is an experiment to determine shot effectiveness, that is how to hit the ball hard and keep it in. I can keep my wrist locked and hit topspin, or I can "roll" the wrist, to use Braden's highly inaccurate description. Perhaps it's best for the student to try both and notice the difference since an experiment on this has never been done. We all lock our wrists on volleys to punch at the ball, it is a limited striking motion since we are at the net, hit the ball before it bounces, and we have half a court length to work with. But when back at the baseline hitting groundstrokes after the ball bounces, and sending it the full length of the court, why must the limitations of a locked wrist be used? Using the wrist in tennis is a bit like learning to drive a car. You first learn to drive at a lower speed, sure, and when your skills mature you learn how to push the pedal down to go faster, that is on the highway. It's a little scary at first, and it takes a while for you to get used to it, but soon you're comfortable and you know what you're doing. There are different levels to tennis maturation as well, and using the wrist instead of limiting it is a major right of passage for us. The hand "turns" the racket face into the ball on the forehand's forward swing, this description seems to lead to and incorporate the wrist movements described above. How much turn? Not much. Hold your right hand on edge on your desk like a karate chop, and if the top edge is 12 o'clock the bottom is 6 o'clock "turning" the hand means tilting or leaning the hand over to 11 o'clock on a forehand. The symmetrical opposite holds true for two handed backhands, from 12 to 1 o'clock. Pros "turn" a little farther when necessary, but wrist flops belongs to basketball players. One handed backhands also turn the racket face into the ball, but there are two ways. For the more continental grip or slices the racket face has to sort of make an outside-in or right hand turn into the ball to hit the ball head on, unless you hit inside-out spin as well. For eastern grips or topspin shots the turn is like the imagery in the preceding paragraph though in the opposite direction, from 12 o'clock to 1 o'clock, but turning less than half as much as a forehand's turn. Surely you can keep the wrist 100% locked and not moving (no deviation) on a backhand [and I'm willing to bet no such thing exists] but then don't complain your shot has a lot of spin but not enough pop. Stroke consistency can not be reduced to one tennis sound bite, there are a few areas involved that contribute to consistency of which you are aware: get to the ball comfortably, see the ball well, be strong enough in your hand and wrist, not be too ambitious or lazy with the hit, hit on time mostly. The second of two major components for stroke consistency requires using the wrist as intended (first being the hand), and to do this you learn to limit the movement of the larger hip and shoulder joints. And has anyone even mentioned limiting the movement of the neck joint to keep the head steady as opposed to just saying don't move the head? Of course you can abuse the movement of the wrist joint and you'll be remarkably inconsistent, so don't get carried away. But when you're about to hit the ball you can increase your stroke consistency and power if you slow down your body's rotation and instead focus on bringing the racket up into the ball while allowing your hand to do its natural thing of using the wrist. You'll crack one for sure.